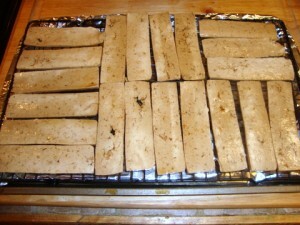 Tofu bacun is so easy to prepare and yields excellent results. 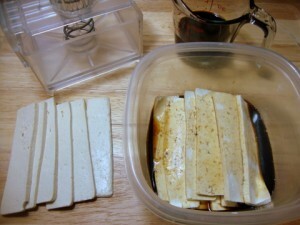 It just requires a little time for pressing the tofu (8 to 12 hours), marinating the tofu with the seasoning liquid (a minimum of 12 hours), and low-oven baking or drying in a food dehydrator (about 2 hours). For this recipe I recommend using a tofu press, such as the TofuXpress®, that will hold the shape of the tofu while compressing the texture and removing the water prior to marinating. This recipe yields about 8 oz./½ lb. of bacun. Press the tofu to remove as much water as possible. Blot the surface dry and then cut ⅛-inch thick slices lengthwise. Combine the marinade ingredients and stir until the sugar dissolves. If you prefer a less salty bacun, opt for low-sodium tamari or soy sauce. Pour a small amount of the marinade into a small food storage container and begin layering the tofu strips into the container, overlapping the slices as you layer. Handle the slices carefully as they will be rather delicate. Pour the remaining marinade over the slices and seal the container. There should be sufficient marinade to just about cover the slices completely. Seal the container and refrigerate for a minimum of 12 hours and up to 48 hours, with 24 hours being ideal. Preheat the oven to 225°F/110°C. Place a non-stick baker’s cooling rack on a baking sheet. If you don’t have a cooling rack, line the baking sheet with parchment paper. Place the slices in a single layer on the rack. Again, handle the slices carefully as they will be rather delicate. Place the sheet on the middle oven rack and low-bake for 2 hours. Alternately, a food dehydrator can be used at the highest setting. Dry for 2 hours or until the slices are dry to the touch but not completely dehydrated. Place the slices in a food storage container and refrigerate until ready to finish and serve. 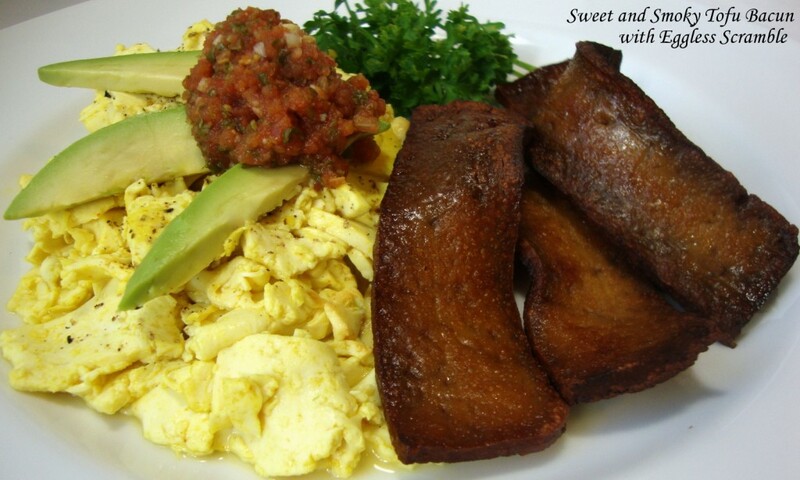 Tofu bacun benefits from frying in oil to create the crispy texture. Pour enough high-temp cooking into a skillet to cover the bottom completely and place over medium-high heat. Add the strips to the skillet without overcrowding and fry until nicely browned, turning occasionally. Transfer to a plate lined with paper towels to drain. Try laying the bacun on the towel with an undulation to mimic a cooked bacon appearance. If desired, season with some coarse ground black pepper while still hot. The bacun will crisp further as it cools and will hold the undulated shape. Serve immediately or store in a sealed container in the refrigerator until ready to use in recipes. Pre-fried bacun can be reheated in a low oven.